With the new year upon us, it's a good time to try something new. Like taking a photograph each day for a year. If your life is anything like mine, not every photo is going to be super interesting. There are days I never the office while editing photos. It will be a challenge to try and make an interesting photo on days like those. Luckily the cameras on most new phones are capable of taking some great images. It's true that the camera you have with you is the best camera. There's really no excuse. For anybody who loves taking photos and has an iOS device, there are many apps to make it easier. 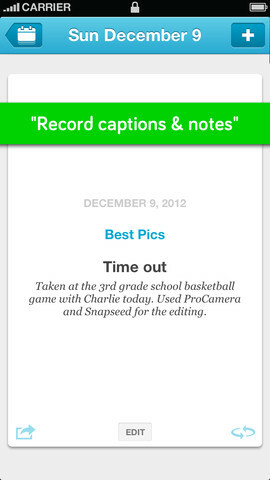 They'll help you catalogue your shots and even remind you to take a photo at a prescribed time each day. I've chosen to use Collect: Photo a Day, which is available for free on the App Store. I'm looking forward to the challenge.